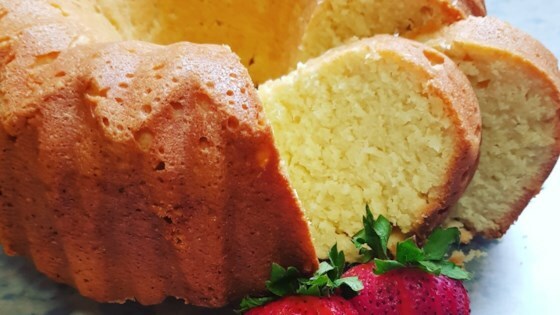 "A moist coconut pound cake, a crowd pleaser. I use this recipe for making wedding cake layers." In a large bowl, cream together the butter and cream cheese until well blended. Add sugar, and beat until light and fluffy. Blend in the eggs one at a time, then stir in the coconut extract. Mix in flour and baking powder until just moistened, then stir in coconut. Spoon batter into the prepared pan. Bake for 1 hour and 20 minutes in the preheated oven, until a knife inserted into the cake comes out clean. Allow the cake to cool in the pan for 10 minutes before inverting onto a cooling rack. This cake recipe also does well baked in layers. Will make three 8 inch layers, or one 10 inch layer and one 6 inch layer. Reduce baking time if making as a layer cake, but keep the temperature the same. Test for doneness as indicated in recipe. A lot of reviewers said was a tad dry, and I agree.